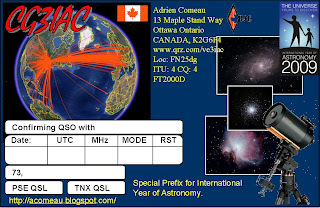 Two new QSL cards will be on their way. 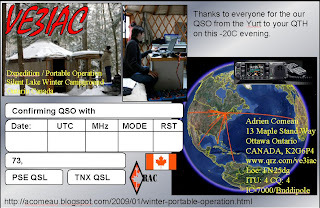 For the winter camping "DX-pedition" I made up the card below, it shows the Yurt, and the cozy operating station inside. The globe was generated from Google Earth through Ham Radio Deluxe and the IC7000 radio image complete card. I have not posted these in the mail but I will in the next few weeks.